Tomb Raider slot machine from Microgaming takes us back to the late 1990’s and the release of one of the most memorable video games of all time featuring the buxom Lara Croft, later played by Angelina Jolie in the movies. The mobile slot features 5-reels, 15 paylines and nice max jackpot of 7,500x, and there is also a free spins bonus with 10 free spins and a 3x mulitplier. Keep reading below for all the details in the Tomb Raider slot review. Based on one of the most iconic video game franchises of all time, Microgaming’s Tomb Raider slot invites players to join heroine Lara Croft on another exciting archaeological adventure. The regular game is a fairly straightforward five-reel, 15 maximum payline slot, with wilds, scatter symbols and a bonus feature. Various relics and lovely Lara herself represent the slot’s higher value symbols, with a maximum jackpot of 7,500x awarded for hitting Tomb Raider logos on all five reels. Released in 2004, the game is unfortunately starting to show its age, with little in the way of animations of fancy graphics to draw players into the experience. Indeed, in terms of aesthetics, the Tomb Raider slot machine looks more like the original PS1 version of the game than any of the next-gen titles. The bonus features in the Tomb Raider slot are simple and relatively easy to activate. The first offers three spins whenever three or more Lara Croft scatter symbols appear anywhere on the game board. Once activated, players will be awarded 10 free spins, with all subsequent wins receiving a 3x multiplier. The second is the only feature that really deviates from conventional reel play and is triggered when three Idol symbols appear on any winning payline. In addition to awarding an instant cash prize, should this happen, players will be transported to a pick game where they uncover idols to win further rewards – with the number of idols you get to pick set by the number of symbols matched. The Tomb Raider logo also acts as a wild and can be used to complete any winning payline, further improving your chances to win and making the game a relatively low variance slot to play. That being said, the limited selection of bonus features means you’ll really need to hit the jackpot to score big. Though a cutting-edge slot when it was first released, the Tomb Raider slot is no longer able to compete with more modern titles these days due to its dated look and fairly basic selection of bonus features. 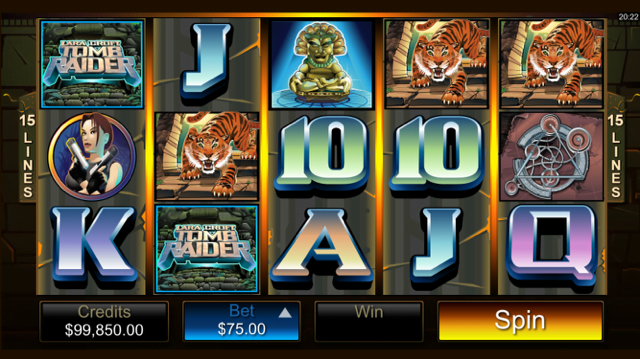 Like the Tomb Raider slot review? Check out these as well…..